Teaching children how to bounce back from adversity starts with modeling our own mistakes and how we forgive ourselves for them. This expert Q&A with Sharon Salzberg, Dr. Chris Willard, and Dr. Mark Bertin explores what it means to go through the muck instead of around. As part of the “Garrison Talks at the JCC” event series at the Marlene Myerson JCC Manhattan, meditation teacher and author Sharon Salzberg recently spoke with Dr. Chris Willard, a psychologist and educational consultant, and Dr. Mark Bertin, a developmental pediatrician and mindfulness teacher, about how to cultivate resilience in children. Sharon Salzberg: Do you think it’s harder for kids these days? That’s sort of the common understanding or feeling. Mark Bertin: I would say it’s a mixed bag. I think some of what we’re living with as a culture makes it feel like it’s harder for kids. It makes it really frightening to be a parent in some ways and frightening to be a kid in some ways that aren’t necessarily real. I think part of it is a lot of the information being fed and the pace at which we’re being fed the information make the perception of it seem different. Then the flipside of that is, certainly, it is obviously a really unsettled, difficult world we’re living in. I think there is a reality to the sorts of conversations we need to be having, to the impact of technology and the internet on kids. It’s a little bit of both, I think. Chris Willard: Yeah, I think it’s really different. There are new challenges, but there are always technologies (not screen technologies). We know more about child development. We know more about how to build resilience in our kids. We have more tools, but there are more things we need to use them on, because the world is just more complicated and more challenging. All of us who are parents, I think, can certainly see that. I don’t know if it’s harder for kids, but I think it’s maybe harder for parents. Mark Bertin: I think just the volume of information parents are exposed to is overwhelming. Chris Willard: And conflicting information. You can go and confirm what you want about your parenting style, just like you can about any political viewpoint you might have as well, right? Sharon Salzberg: Interesting. How would you define resilience? Chris Willard: I’ll steal Linda Graham’s definition. Linda Graham says it’s your ability to bounce back from life’s difficulties. The Buddha said, “Life is suffering.” We might say, “Life is stressful.” How well do we manage those stresses? How well do we encourage our kids to manage those? Which is different than: How well do we manage our kids’ stresses? How much do we give them the skills to deal with life’s stresses, which are inevitable? Mark Bertin: When it comes to family, I’ve always felt that if the basic teaching of a lot of this is that life can be pretty uncertain and challenging, and some of how we feel and live day to day comes from how we manage that situation, parenting is the crux of it. It’s a situation where we are invested more than anything else in the world, and yet there is constant uncertainty and change, and we can’t control and fix everything. So, resilience is both for parents and kids, as Chris defined it. In the midst of that, how do you bounce back when things don’t go like you feel they should? Sharon Salzberg: Sometimes I’ve heard kind of the stress response defined as the stressful situation meeting the amount of resource we have within to devote to it. What helps create that sense of resource for a child? Chris Willard: To me, this is where mindfulness can fit in, but I think this is bigger than just mindfulness. It’s about being able to face that stress. The stress response is fight or flea, or freeze and forget it, or kids will have a different F-word that they put in there, right? Basically, can we also face that? People are interested now in not just in the fight or flight response, but in the attend and befriend response, which I kind of think of as mindfulness and compassion. Can I show up mindfully to what this stress is? Can I maybe start to learn how to befriend that, have some compassion toward the situation or toward myself through it? Sharon Salzberg: Attend and befriend, doesn’t it also have to do with a sense of connection with others, like you’re not facing whatever you’re facing, in isolation, but some sense of community? Mark Bertin: When you look at a huge topic like resilience—obviously, all of us up here are interested in talking about mindfulness, but it’s not only about this particular practice alone. Robert Brooks, who’s just a brilliant researcher—actually, I think he’s more of a lecturer about resilience, talks about just the concept of having, for kids, what he calls the charismatic adults in your life. Just one really strong, deep relationship goes a long way to building resilience. I think the same thing goes for adults. When I look at resilience, I think that’s always foundational to it, relationship, in addition to everything else we can talk about tonight more specific to various topics. Chris Willard: A benevolent adult—I also think about the notion of the benefactor in someone’s life and in practice potentially. He responds to the gender issue by saying, “Well, it was the ’50s. The people who were bringing the kids to see Dr. Winnicott were the mothers.” So, we’d say, “Be a good enough parent.” Someone in the room always raises their hand and says, “What’s a good enough mother?” And then Mark says, “It’s someone who can survive their child’s rage.” And the someone raises their hand and says, “What does it mean to survive your child’s rage?” And then Mark says, “You’re neither kind of intrusive and invasive nor shunning and withdrawn. You’re there with it. You’re beholding it.”And then I always say, “Well, that’s what we call mindfulness. We learn to do that for ourselves as well with the various things that come and go, emotions and thoughts, all these various states.” That’s something, that kind of holding quality. Chris Willard: Absolutely. I come back to—people have probably seen this meme online that says: Never in the history of calming down has anyone ever calmed down by being told to calm down. [laughter]I often think about that in terms of parenting and the work we do. What we’re trying to do is create a space in which it’s safe enough for our kids to be calm, but also safe enough for them to rage and still feel that connection, right? Whatever is going on for them, do they know that that love is still there, that that connection is still there? Does it have to be perfect? No, but good enough, hopefully. What we’re trying to do is create a space in which it’s safe enough for our kids to be calm, but also safe enough for them to rage and still feel that connection. Mark Bertin: Yeah. I think that’s an important message to the whole discussion of parenting in general. There is no perfect. Even sitting up here for a night like this, it’s so easy to feel like, “Oh, just one more thing to do.” But, really, the message is kind of the opposite. It’s about having that deeper connection and relationship, in a safe space to be raised. Some of these topics can cross over into almost any aspect of parenting. You look at a topic like discipline. There’s so much debate about it has to be this way or that way. In reality, there is no one way. It’s just important to recognize that you need a foundation of a close relationship and depth. That resilience as a parent, when things get challenging, to try to just be there until some path seems clear, not to add to the situation. Then the flipside is, as Chris was saying, part of adversity, from a child’s point of view, is you might get in trouble once in a while. That’s part of mindfulness, and that’s part of raising resilient children, too. Within a safe environment, that’s just part of your experience, and that’s all just part of family. Sharon Salzberg: I’ve often said that, for a while, my favorite definition of mindfulness was: Mindfulness is several types of meditation practice that are based on becoming more and more aware of your experience in a way that’s not judging, in the sense of you’re not rejecting, and you’re also not buying into right away, so you have some space to sort of be with it in a different way. And I thought: that is a great definition of mindfulness. What does it imply? It implies knowing you’re feeling angry when you’re starting to feel angry, not after you’ve exploded, not after you’ve sent the email, not after you’ve hit someone in the mouth. But it also implies a certain relationship to that anger. It’s like, if you are so ashamed, and you’re so upset, and you’re so frightened by what you’re feeling, you just try to stamp it out. You get tighter and tighter ’til you explode. But at the same time, if you lose all centeredness and you get consumed with the feeling and defined by it and overwhelmed by it, you probably hit a lot of people in the mouth, [laughter]’cause life is very frustrating. And I just thought: what a great definition, to see the anger quickly, to see it in a more balanced way, that holding environment. That gives us some space. Maybe, in that space, we consider: You know, I hit someone in the mouth last week. Didn’t work out that well. [laughter]Let me try this. Something like that. It’s very empowering, actually, to have that ability. Sharon Salzberg: I have a quote from you Chris: “Contemplative practices, like mindfulness, allows kids to heal and soothe themselves rather than distract themselves from the pain.” Which also made me think about trauma. What would you say in terms of that kind of more extensive pain, like trauma? Chris Willard: Mindfulness creates an internal space, I think, in all of us, an internal holding environment. My job as a therapist is to create a space in which kids or adults or whoever can be vulnerable enough to open up and look at their pain and then close that up again. Ultimately, my job—and ultimately any parent’s job—is to also help a kid create that space inside, to look at their own pain, to give some spaciousness around it. Living with trauma is incredibly claustrophobic. It’s just always there. It’s always this thing that’s with you all the time. The more spaciousness we can help people create around that—ourselves, our kids, our families—the more opportunity there is for healing that, working through that, and mindfulness can be a really powerful part of that, as well as re-regulating the brain and quieting down the amygdala, which is where our fear response happens. A lot of trauma gets kind of processed through there. So, it just quiets the whole nervous system down. Sharon Salzberg: What about the role of self-compassion in that way? I think that’s both for the parent and the child. Mark Bertin: I think self-compassion is so important to be teaching our kids, to be practicing ourselves as parents. It’s okay that I’m not perfect. I can move past my mistakes. And then I can also model mistakes for my kids, and that’s going to be important for them in terms of their resilience and their learning. I can also model mistakes for my kids, and that’s going to be important for them in terms of their resilience and their learning. Chris Willard: There’s a growing discussion, both in the world of mindfulness practice but also psychology, about this idea of self-compassion. I think the easiest way to imagine it is just recognizing that there’s a certain perspective we would take towards a close friend going through a challenging situation, or who makes a mistake, or is having a hard time with their kid. We can just sort of—you can even do it now and just imagine your best friend comes to you and just had this terrible fight with their teenager. It’s nothing we would ever do to anybody else, so the concept of self-compassion is that we can actively work on changing that inner voice. Self-compassion can sound a little fuzzy, but it’s really not. It just means that we can work toward giving ourselves the same benefit of the doubt that we would anybody else. There are many aspects of practice that build on it. I think, for all parents, it is part of just cutting through the perfectionism that just drives us to be doing more and fixing more and scheduling more and constantly worried. 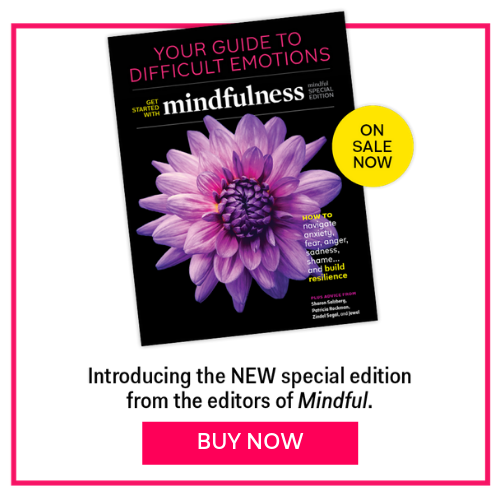 Mark Bertin: And the research really finds, on self-compassion, that people who are higher in self-compassion are more likely to bounce back from mistakes that they make and are more likely to take healthier risks in life, because they’ve got that soft landing of: I’m not gonna judge myself so harshly by being so perfectionistic all the time. Then they can actually take the right risks and do all those things that they wanna do, and bounce back from any mistakes that we do all make as parents. So, it really does build our resilience. That’s also what we want our kids to internalize is not that harsh voice but that kinder voice for when they make mistakes. They can just learn from them. I was listening to something on the way down about how different cultures deal with mistakes so differently. American culture is just: If you make a mistake, you’re just an idiot. We’re just so harsh on ourselves. It’s just seen as part of the process of learning in so many other cultures. We give lip service to that, but we really don’t practice that, and we don’t model that for our kids, either. I think it is really important to model how we make mistakes and how we forgive ourselves, in front of our kids. Chris Willard: It also is another place that overlaps a lot. If you’re parents, you’ve probably heard of the concept of mindset. The concept of mindset is Carol Dweck’s research, which says that: In any situation, focus on hard work and effort instead of a fixed mindset and expected outcomes helps you sustain motivation, in essence. So, for kids, they’re much more likely to work harder and persist when they hit the first bump in the road if they’ve learned that effort is what got them to the starting line in the first place. It is an interrelated concept to the bigger idea here. We would tell our child, “Yeah, you fell down. Get up. Do it again.” But that isn’t how we’re often talking to ourselves. Sharon Salzberg: It’s interesting. What do you think about actually teaching kids meditation and at what age? Before that, I was thinking, really, it’s for any of us. Okay, so I learned it first at 63. It’s all right. It’s sort of the same principles. Mark Bertin: Yeah. I always look at family mindfulness—I always feel like working—I always work backwards when I talk about mindfulness in families, both in terms of your kids are learning—I almost feel like I want to be able to talk about two things simultaneously. On the one hand, it is important to recognize that, in large part, you can’t help the fact that kids are learning from you. Family mindfulness starts with your mindfulness practice. Your kids aren’t always gonna buy in immediately. If you want to teach your kids mindfulness, you have to have some familiarity yourself. All of that’s true. You want to tie that very closely to a self-compassion practice, because you’re never going to be mindful all the time. You’re gonna lose your temper and all those things also. But when you talk about mindfulness with children—and I’m interested to hear how Chris talks about it—I usually find it easier to just conceptualize moving backwards. If you look at teens, it has a lot to do with making it accessible to teens, but the practices aren’t fundamentally different. Then, as you move younger and younger, you have to simplify the concepts some and maybe shorten the practices a little bit. Then you just keep moving backwards to the point where, in early childhood, as with like one of Chris’ new books, it really—early childhood is all about play, in many ways. That ties together many of the threads we’ve already brought up today, in that play, first of all, in early childhood, is a large part of how children develop executive function. One of the things about seeing early childhood with clarity is sort of cutting through all the messages we’re getting from everywhere else and recognizing that just playing is one of the most important things kids can do. In the modern world, that sometimes takes an active effort to protect that time, because we get busy. But then, when it comes to mindfulness in early childhood, it means making the activities that have to do with meditation often play-based; or even if you’re doing a breathing practice, you add some imagery to it, you make it more—you connect with them differently. Chris Willard: That is, to me, how I really think of teaching kids mindfulness. Sometimes I think we’re really just teaching the elements of mindfulness, not even teaching them mindfulness, per se. I look back at experiences I had as a kid, and I remember going to nature camp and just sitting and listening to all the sounds in the forest. “Can you hear the trees whispering to each other?” Or we’d walk as quietly as we could in the woods. When I first kind of heard the word “mindfulness” many years later, realizing: Oh, walking as quietly as we could took so much focus. That was almost like the mindful walking that I also learned. It’s building into what kids are maybe already doing, building it into play, as Mark said. And what happens now? The kids can stand still for like 10 or 15 minutes. He makes it playacting and fun and an image, just like we might use in yoga or might use in a visualization practice, but in a way that’s really accessible or kids. Those are some of the ways that we can start sharing some of these practices with kids. They start to grow up, and then they maybe are just focused on their breath, or maybe some of us still do focus on images, and it’s really powerful. Dr. Mark Bertin is a developmental behavioral pediatrician and author of Mindful Parenting for ADHD, The Family ADHD Solution and How Children Thrive: The Practical Science of Raising Independent, Resilient, and Happy Kids. He is an assistant professor of pediatrics at New York Medical College, on the faculty of the Windward Teacher Training Institute, and on the editorial advisory board of Common Sense Media. Sharon Salzberg is a meditation teacher and New York Times best-selling author. She is the co-founder of the Insight Meditation Society in Barre, Massachusetts, and has played a crucial role in bringing Asian meditation practices to the West. Sharon has been a student of meditation since 1971, guiding retreats worldwide since 1974. She is a weekly columnist for On Being, a regular contributor to The Huffington Post and the author of many books including Real Happiness, and Lovingkindness.